The Greasy Pole competition is a major draw at Saint Peter's Fiesta in Gloucester, Mass., which has been running since 1927. The men dress in outlandish costumes and try to be the first to grab a flag at the end of a very slippery pole. Winners are written into the local history books as legends, and get free drinks all night. It's not every day that you see a burly man dressed as a hula girl running across a greasy wooden pole high above the water. NBC10 Boston is kicking off a new video series called the Boston Bucket List where we'll find and share unique and one-of-a-kind experiences in the Boston area that you just have to try before you die. Saint Peter's Fiesta in Gloucester, Massachusetts, has an annual contest that was a perfect fit for the first installment in our series. The Greasy Pole Competition is a three-day event during the festival where brave competitors from the fishing community gather together to see who can be the first to grab the Italian flag. Their path to the flag is a 45-foot-long wooden pole 25 feet above the water covered in a generous helping of grease. The first round of each day's competition is a practice session to test their balance and spread the grease along the pole. The second round is an all-out contest to see who can hold their footing and reach the end. "My strategy is to find my best speed without falling off in the sense trying to keep your balance. If the grease gets ya, the grease gets ya," said Friday 2012 champion Ross Carlson before his 2018 walk. Each day's winner is written in the history books as a local legend, and, perhaps more importantly, they get to drink for free as they are carried to various destinations through the streets. "It is just something that binds the community together every summer," said Friday 2009 champion Jason Favaloro before the start of the 2018 competition. "You’re just a legend for one year, that’s it plain and simple. You’re a legend for one year, and you’re a legend forever." The event traditionally features men, but women have occasionally crossed the greasy pole as well. Many of the men who compete dress as women or characters like Power Rangers, Santa Claus or Fred Flintstone. Emergency responders wait nearby, because walking across a slick piece of wood in the air can be dangerous. Minor injuries are common, but some walkers have been seriously injured, at times even breaking bones. Each contestant must sign a waiver before attempting to go after the flag. 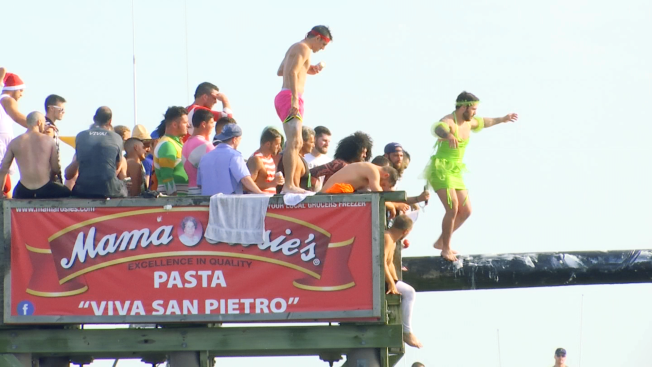 Saint Peter's Fiesta Committee President Joe Novello has seen every greasy pole contest, and witnessed a man knocked unconcious in the first year. One 2018 contestant had two fractured vertebrae in his neck after another greasy pole walker fell on him in the water as they celebrated the winner. While it is a competition, the greasy pole is about more than just being written about in the local history books. The costumed men, shouting "Viva San Pedro!" as they revel in the streets, are there to establish the importance of their brotherhood as they cheer each other on. The drinks flow and the cheers continue all day and well into the night after the winner is declared. All of this is in honor of Saint Peter, the patron saint of fishermen celebrated by the five-day festival for over 90 years. The men pray to his statue before they make their journey across the perilous pole. The greasy pole is just one part of a celebration that brings families together and invites the rest of the world to join in. Witnessing this thrilling competition, and the excitement it brings to this coastal city, is something everyone should do at least once in their life. Have something you'd like to add to the Boston Bucket List? Tweet your idea to @NBC10Boston with the hashtag #BostonBucketList.